This modern and functional hotel boasts 85 rooms. There are 82 double rooms and three Junior Suites with a living room. 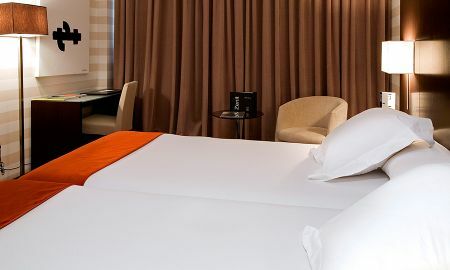 All rooms are fully-equipped with the newest technical devices to ensure that guests have a comfortable stay. The hotel features suitable rooms for events, meetings and ceremonies or workshops. Morea, the hotel's restaurant, serves traditional Spanish dishes in an extraordinary innovative style. Zenit Pamplona also offers special gluten-free menus and has disabled-friendly facilities. Moreover, the hotel guarantees a sustainable water consumption and an environment-friendly policy. This hotel is located in the new business area Galaria-Mutilva Baja right in the business center of Pamplona. You will be in the city centre in just five minutes, and at the International Airport Noain in only three minutes. The restaurant is closed on Sundays for lunch and dinner (except from 5 to 14 July) and from 24 December to 6 January, both dates inclusive.